The brain is being shown from the dorsolateral aspect (as in Figure 14A). 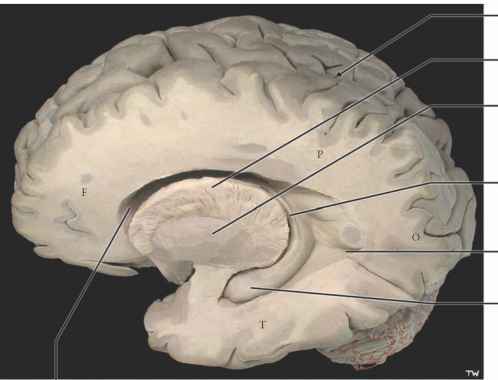 The left hemisphere has been dissected by removing the cortex and white matter above the corpus callosum: the lateral ventricle has been exposed from this perspective. The choroid plexus tissue has been removed from the ventricle in order to improve visualization of the structures (see Figure 20A). This dissection also shows the lateral aspect of the lenticular nucleus, the putamen, and the fibers of the internal capsule emerging between it and the thalamus (see Figure OA, Figure OL, Figure 7, Figure 25, and Figure 27). A similar dissection has been performed in the temporal lobe, thereby exposing the inferior horn of the lateral ventricle (see Figure 20A). A large mass of tissue is found protruding into the inferior horn of this ventricle — named the hippocampus, a visible gross brain structure. In fact, the correct term now used is the hippocampal formation. In a coronal section through this region the protrusion of the hippocampus into the inferior horn of the lateral ventricle also can be seen, almost obliterating the ventricular space (shown in the next illustration; see also Figure 29, Figure 30, Figure 38, and Figure 76). 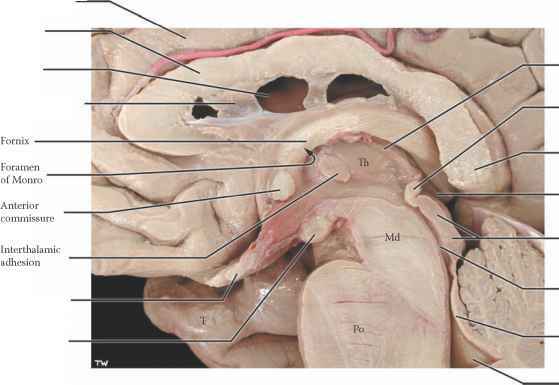 70A and Figure 70B), and it continues over the top of the thalamus to the septal region and mammillary nucleus (discussed with the previous illustration). We now know that bilateral damage or removal of the anterior temporal lobe structures, including the amygdala and the hippocampal formation, leads to a unique condition in which the person can no longer form new declarative or episodic memories, although older memories are intact. The individual cannot remember what occurred moments before. Therefore, the individual is unable to learn (i.e., to acquire new information) and is not able to function independently. 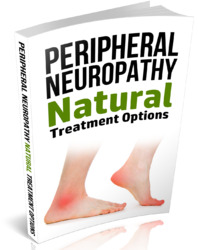 If surgery is to be performed in this region nowadays, special testing is done to ascertain that the side contralateral to the surgery is intact and functioning.